Sausage and Cheese Stuffed Tomatoes, Thyme for Cooking seasonal first course. If you can't find bulk sausage, get regular sausages and squeeze the meat out of the casing of 1 or 2. 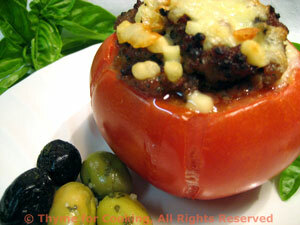 I put a bit of cheese in the bottom of these, it melts into the tomato, absorbing some of the juice. Heat oil in medium nonstick skillet. Add paprika and sauté 30 seconds. Add oregano, sausage and sauté until it's brown, breaking it up as finely as you can. Slice the tops off of the tomatoes and scoop out the center, 1 1/4" - 1 1/2" (4cm) deep. Put a bit of cheese in the bottom of each tomato. Spoon meat mixture on top of the cheese, dividing evenly. Put into a small, shallow baking dish and bake at 400F (200C) for 15 minutes, until tomatoes are hot and sausage is browning. Remove, sprinkle remaining cheese on top of each tomato. Return to oven until cheese melts, about 5 minutes.